Implementing a management solution that is designed specifically for virtual environments is critical to ensure that you are monitoring the metrics and issues unique to virtual environments. This will ensure that you are able to keep up with the higher rate-of-change and can scale as your virtual environment grows. 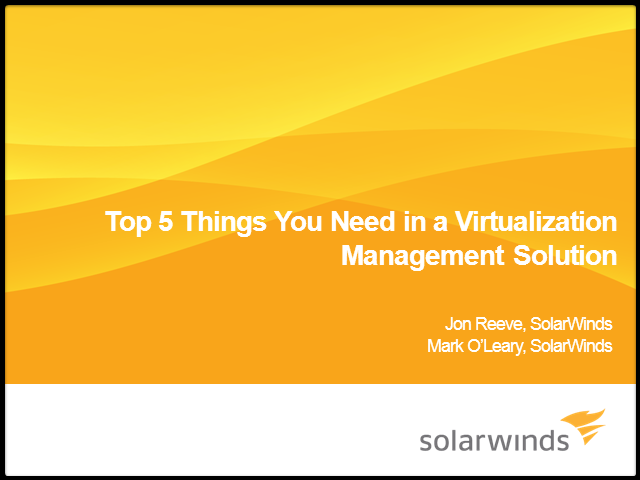 In this presentation, we will look at the top five areas that you should be looking at when choosing a management solution for your virtual environment and also covering the reasons why you need to use management solutions that are designed specifically for virtualization. Oftentimes when it comes to celebrating women in technology, we hear a lot about individual change-makers and one person's astonishing journey up the corporate ladder. However, what we hear about much less frequently is peer-to-peer support and guidance. How are female leaders in hi-tech careers growing both their teams and their company's product? How do women in different business functions successfully build out high-performing diverse teams, get products to market, and drive revenue? Tune into this live panel discussion with experts across industries, fields and backgrounds for an in-depth, peer-to-peer fireside chat to answer these questions and more. Learn how we can better support and enable one another to be successful women leaders, from creation, to ideation, to innovation and beyond. Bala Kalavala Founder & CIO – Adiya Inc. Automation may offer a wealth of benefits to an organization, but only when approached through a strategic business lens rather than IT initiative. Every organization has its own goals – Digital Transformation, Cloud Migration, enhancing productivity, deriving greater meaning from more data – and will need to consider these as well as strengths and weaknesses before embarking on its own transformation journey. Join us to review how to fundamentally rethink the way Intelligent Process Automation can be adopted within working environments and how DevOps will be impacted to create the effective and efficient organization model of the future. Gail Orenstein is an award winning photojournalist & drone journalist covering humanitarian areas and conflict zones. She is an FAA and CAA licensed commercial UAV pilot and has droned in 21 countries. She is a speaker and educator and a champion of women's issues. Having a role model and mentor in your career is extremely important, especially for women in hi-tech careers. Hear from leading industry trail blazers and female leaders as they share why this is important and how to be a role model for future women in tech. Join this live panel discussion with experts from around the world as they discuss their career paths as women in tech, challenges they've faced, and key learnings from their experiences. Nadine Thomson, Digital Technology Consultant and Advisor, leads the transformation of businesses through technology change. She has worked internationally across a range of industries including media, retail, travel and financial services. Nadine has a computer science background and couples business knowledge with deep technical understanding to help businesses evolve. Nadine has recently worked as Group CTO Conde Nast International (Vogue, GQ) and Technology Director for Vue Cinema. She is currently consulting for News UK on their digital technology structure and operating model. •Storage challenges when serving a large number of compute nodes, e.g. name space consistency, distributed locking, data replication, etc. FICON (Fibre Channel Connection) is an upper-level protocol supported by mainframe servers and attached enterprise-class storage controllers that utilizes Fibre Channel as the underlying transport. The FCIA FICON 101 webcast (on-demand at http://bit.ly/FICON101) described some of the key characteristics of the mainframe and how FICON satisfies the demands placed on mainframes for reliable and efficient access to data. FCIA experts gave a brief introduction into the layers of architecture (system/device and link) that the FICON protocol bridges. Using the FICON 101 session as a springboard, our experts return for FICON 201 where they will delve deeper into the architectural flow of FICON and how it leverages Fibre Channel to be an optimal mainframe transport. Selecting a vendor partner (or partners) is one of the most critical decisions enterprises will make on their IoT journeys. The right partner makes all the difference: enterprises with top-ranked partners report greater success in generating revenue, cutting costs, and optimizing business processes via IoT. • Who are the right providers? • What are the critical factors to consider in selecting one? This webinar reviews the provider landscape and highlights critical selection factors for companies of all sizes and industries. This webinar is part of BrightTALK's Ask the Expert Series. After the hype created by Internet of Things (IOT), digitization of everything has become a norm. Digitization would become a competitive advantage in every aspect of running a successful organization. Be it Manufacturing, Sales and Marketing, Customer Experience, Supply Chain, Finance & Operations, Human Capital, Strategic sourcing; every single function in an organization is going to undergo this massive change and transformation. Most of us are still trying and struggling to understand how profound this change would be and what will it mean in terms of providing additional business capabilities to companies. The impact of this change on the organizations can be both positive as well as negative. Join this live Q&A with Ashish Sonkusare, Leader, SAP Digital Transformation at HCL Technologies, and Kelly Harris, Sr. Content Manager at BrightTALK, for an in-depth look at enterprise architecture and infrastructure, and digitizing your supply chain. Everybody knows IoT is the wave of the future. But what are successful organizations doing differently when it comes to their IoT initiatives? Are they saving more? Generating new revenue and lines of business? Or increasing operational efficiency and other metrics? This webinar unveils the secrets of top-performing companies when it comes to IoT initiatives. You'll learn how they plan for, design, secure, and operate their IoT initiatives--and how they track the benefits. Machine learning, or AI, may be considered as sophisticated technology which can only be understood by crazy nerds, or some dangerous technology can destroy human beings one day. As a machine learning data scientist, Joanna wants to tell you that machine learning is not either. It is very fun, can be learnt and mastered, and do more benefits than harm to the human beings. More important, it is a very suitable career for women. In this presentation, Joanna will use a few use cases to represent its values and its technology (including deep learning), etc. I will also talk about the skill sets needed for machine learning. - What is machine learning / artificial intelligence? Everyone talks about IoT, and many organizations are implementing it and reaping the business benefits. But even those who have had IoT projects deployed for years may not have a comprehensive architecture and framework in place to help guide technology decisions and streamline operations. Join Nemertes CEO Johna Till Johnson as she reviews the IoT architecture and framework and shares guidance gleaned from leading-edge clients and research study participants. Service monetization is sometimes a competitive differentiator or an answer to disruptive competitors. Irrespective of the reason for transformation, service monetization provides a great platform to model business models to improve customer retention and increase revenue in the longer term. This session will provide participants with an understanding of service monetization challenges and how companies can transform their overall business process and quote to revenue in particular. Join Arun Trivedi, Partner, Wipro Technologies and Kelly Harris, Senior Content Manager, BrightTALK for a live discussion on service monetization and revenue streams from XaaS. Best practices for achieving Enterprise IT and operational efficiency. The Enterprise Architecture channel presents the next generation of Enterprise IT: recognizing the strategic importance of digital transformation and the data center to make companies more nimble and competitive. These presentations will help demanding IT and BizOps professionals achieve flexibility, scalability and performance with reduced risk and complexity.